Dad’s and daughters are realizing that a strong relationship between father and daughter is just as important as daughters grow older. 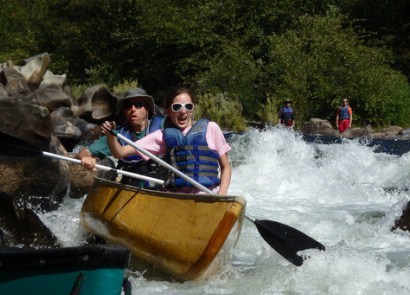 This trip is designed to provide fathers with growing daughters a chance to connect with each other for 4 fun filled days on the Stanislaus and Mokolumne Rivers! No canoeing experience or equipment is required at all for this trip. The locations of the trip will ultimately be determined by the experience of the campers but typically we spend the first part of the trip enjoying the Stanislaus River and involves a lot of splashing, easy paddling, and river fun. This is a great way to get familiar with the boats, equipment and the feel of the river. The second leg of the trip takes place on the Mokolumne river near Jackson, CA. This is a bit more advance river with an additional element of bigger rapids and adds an element of excitement to the trip. In addition you can expect great food, memory making, and a growing relationship between father and daughter.